DURHAM, N.H. – Since the Industrial Revolution, the amount of carbon dioxide in the atmosphere has rapidly increased. Researchers at the University of New Hampshire set out to determine how rising carbon dioxide concentrations and different climates may alter vegetation like forests, croplands, and 40 million acres of American lawns. They found that the clues may lie in an unexpected source, mushrooms. The researchers focused on American lawns because they knew that grass can play a key role in the global carbon cycle because it pulls carbon out of the atmosphere during photosynthesis; the process used by plants to absorb and harness energy from sunlight and convert it into chemical energy. Most lawns across the United States are similar, but differ regionally in their relative proportions of two main types of grasses, C3 grasses and C4 grasses, which use different metabolic pathways for photosynthesis. However, unlike trees, which build rings year after year, grass leaves little behind to study, so researchers got creative turning to mushrooms which feed on the carbon in lawns. "We thought that mushrooms could be a valuable indicator of responses of lawns to carbon dioxide levels in ecosystems because they feed on the dead grass and debris, or carbon, that lawns or other plants put into the ground," said Erik Hobbie, research professor of terrestrial ecology at UNH and lead author on the study. "Since it is challenging to measure blades of grass from grassland ecosystems over decades, we turned to mushrooms, which are widely available through previous collected specimens in labs and museums." In the study, published in the Journal of Geophysical Research: Biogeosciences and featured as an article in the American Geophysical Union's magazine Eos, Hobbie, UNH statistician Ernst Linder, and their colleagues looked at isotopic data from samples of the mushroom Amanita thiersii collected between 1982 and 2009 from 26 locations in the southeastern and south central United States. The scientists combined these data with information on temperature, precipitation, and carbon dioxide concentrations over the same period to look at competition between the two kinds of grass, C3 and C4. C3 grasses, such as wheat, oats, and ryegrass, are called cool-season plants and thrive in a temperature range of 65°-75° Fahrenheit. C4 plants, which include corn, crabgrass, and bluestem grasses, flourish in warmer and drier environments. These warm-season plants and are more efficient than C3 plants at photosynthesis under low concentrations of carbon dioxide. 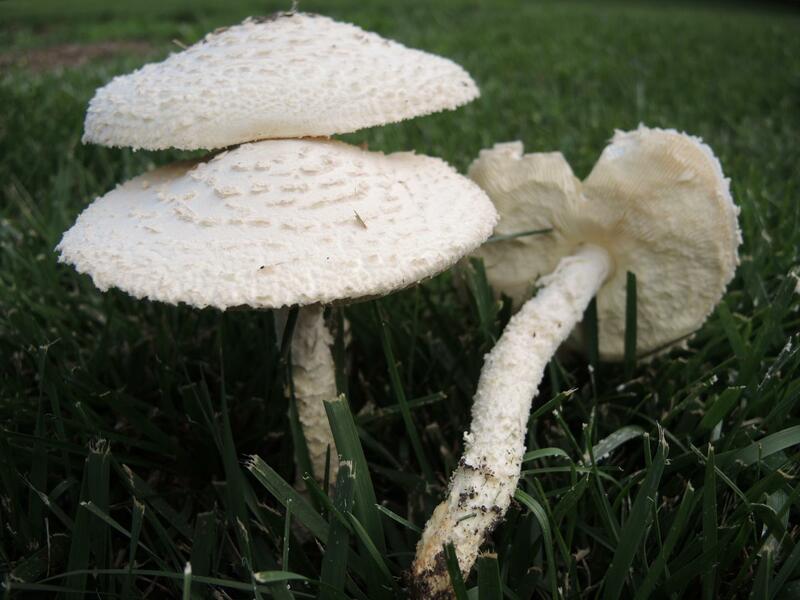 Researchers found that the mushrooms, Amanita thiersii, appeared to be good integrators of the carbon in lawn grasses. Temperature was the dominant climatic influence over C3 versus C4 grass distribution. As carbon dioxide in the atmosphere increased over those decades between 1982 and 2009 and temperatures rose, changes in grass competition and growth were reflected in the carbon of Amanita thiersii. With every 1°C increase in temperature, the proportion of carbon from C3 grasses, as found in the Amanita thiersii, decreased by 12%. But researchers also found that the relative proportion of C3 grasses increased by 18.5% in response to the increase in carbon dioxide concentrations from 341 to 387 parts per million. This suggests that rising carbon dioxide is already influencing plant competition on the American landscape and that preserved specimens of plants and mushrooms could be used more widely to examine current responses to global change.